Riders cross the Lake Fayetteville spillway bridge during the Spring 2017 Square to Square ride on May 13. The latest installment of the biannual Square to Square bike ride is set for Saturday, Sept. 16. Along the way, participants can enjoy three festive pit stops with entertainment, bike maintenance services, and refreshments. Post-ride festivities are also planned near the Fayetteville square. Riders can start at any point along the trail if they’re not able to ride entire distance. Optional shuttles (by reservation) will be available to the starting area, before and after the ride. 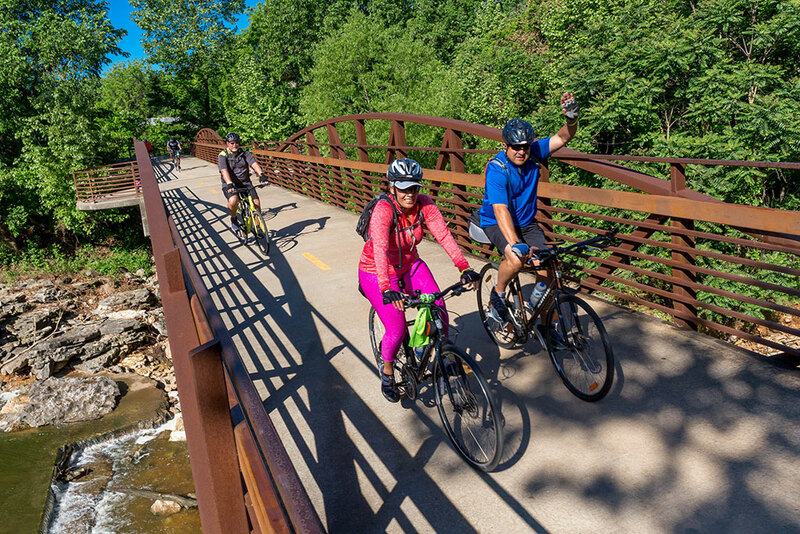 The ride is part of a series of events organized by the Fayetteville and Bentonville parks departments designed to inspire locals to get active, and take advantage of the area’s parks and trails. Riders can register online for a $25 fee ($15 for ages 9-13) which includes an event t-shirt, a water bottle and a finisher’s medal. Registration for kids 8 and under is free. Fees increase by $5 on Aug. 14, and t-shirt size requests are not guaranteed after that day. Registered participants can pick up ride their ride packets at either the Fayetteville Parks & Recreation office, 1455 S. Happy Hollow Road, or the Bentonville Parks & Recreation office, 215 SW A Street, two days prior to the ride. Packets will be available from 8 a.m. to 8 p.m. Thursday, Sept. 14, and from 8 a.m. to 4:30 p.m. Friday, Sept. 15. Riders must choose which city to pick up their packet when registering. Pre-Ride Shuttles: Available for 7 a.m., 8 a.m. and 9 a.m. Finish Line festival: 10:30 a.m. to 3 p.m.
Post-Ride Shuttles: Available for 1 p.m., 2 p.m., 3 p.m. and 4 p.m. Volunteers are needed to assist with various duties. Visit the city’s GivePulse page to register for a volunteer position.